of The Gambia JUFFUREH VILLAGE, The Gambia, West Africa Early in the Spring of 1750, in this tiny village up-river from the coast of The Gambia, Kunta was born. He was the first man-child of Omaro and Binta Kinte, The world came to know him through the book and international television saga, "Roots," written by American-born Alex Haley in the 1970s. Mr. Haleys genealogical research led him here, where he discovered his paternal ancestry. 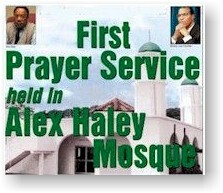 Two years ago during his World Friendship Tour III, the Honorable Minister Louis Farrakhan discovered that Mr. Haley desired to build a small mosque for the village residents. He gave some money to the former government of The Gambia, however, the project never emerged. Min. Farrakhan promised the people of Juffureh that he would fulfill Alex Haleys vision and build not only a mosque, but a school as well. On the birthday of Prophet Muhammad (PBUH), a delegation of officials and members of the Nation of Islam, as well as Christian friends boarded a small yacht and sailed the River Gambia to Juffureh to join in the opening ceremony of The Alex Haley Mosque and School Complex, June 25, 1999. The delegations crossing, however, was luxurious by any comparison to the ghastly ordeal endured by Kunta Kinte, his companions and all those other millions endured during the trans-Atlantic trip to "the new world." The delegation, headed by Mother Khadijah Farrakhan, wife of Min. Farrakhan, and Leonard F. Muhammad, Nation of Islam chief of staff, also included Mustapha Farrakhan, assistant Supreme Captain of the Nation of Islam and son of Min. Farrakhan; Min. Akbar Muhammad, international rep-resentative of the Nation of Islam; Min. Akbars wife, Mariam Aziz Muhammad; Minister Farrakhans daughters Donna and Maria; Brian Muhammad of Ghana who stayed in The Gambia for one month prior to the program to make preparations, and Philip Muhammad from Toronto, Canada, who assisted with the electrical wiring in the new Mosque. Also present were Southwest Regional Minister Robert Muhammad of Houston, Texas; Min. Jeffery Muhammad of Dallas, and Min. Harold Muhammad of Fort Worth, Texas. Members of the Nation of Islam traveled from Atlanta, Philadelphia, Baton Rouge, La., New Orleans, Nashville, Baltimore, Newark, Detroit, North Carolina, Virginia, London, and other locales to attend the ceremony. Upon landing at Juffureh, a Muslim village, the group was greeted by villagers gathered to welcome their brothers and sisters home. Most were clad in traditional African attirewomen in long, colorful sarong skirts with tall headdresses, and men in dashikis with fezzes and kufis atop their heads. As the delegation traveled up the mile long road leading from the dock to the mosque site, children shouted, "Farrakhan, Farrakhan," while elders had tearful eyes displaying their joy at what they were blessed to witness. Before the program began, there was 20 minutes of songs and praise in honor of Min. Farrakhan and the Nation of Islam for this gift being bestowed upon this tiny village. "We are honored to be here today with our brother and friend, President Yahya Jammeh, members of government, religious leaders, visitors from the U.S., others, and the wonderful people of the village of Juffureh to dedicate this humble mosque to the memory of Alex Haley who found his roots in this village," began Mustapha Farrakhan, who delivered the keynote address on behalf of his father. "Alex Haley wrote my father in the early 1970s and told him that the Honorable Elijah Muhammad and Malcolm X were right when they said that many of our fathers who were brought to America as slaves were Muslims. Although he (Haley) was a believing Christian, he desired to build a mosque here in honor of the memory of his Muslim ancestors. "He sent some funds to begin the building of the Mosque, but, unfortunately that building never materialized," Bro. Mustapha continued. " My father came to this village a few years ago and promised the elders of this village that he would complete Alex Haleys desire and build a mosque and skills center in his name. Here we are today, dedicating this mosque which my father and members of the Nation of Islam caused to become a reality," he said as the crowd cheered. "Allah says in the Quran, He who promises and fails to perform after his promise is a devil, " Bro. Mustapha continued. As the Word of Allah is true, and the Promise of Allah is true, the Integrity of Allah is wrapped up in His Will and Power to fulfill His Word, he said. It is also written in the Quran, and it is a part of our prayer, "Verily Allah never breaks His Promise," he told the crowd. "As Muslims, we must be as Allah is: We must perform after our promise. So, our teacher, the Honorable Elijah Muhammad, and His Teacher, whom we believe is the great Mahdi, Master Fard Muhammad, gave us a lesson that asks this question, Have not you learned or heard that your word shall be bond regardless of whom or what? The Honorable Elijah Muhammad gave this answer, Yes, my word is bond and bond is life, and I will give my life before my word shall fail. " Bro. Mustapha said. Many in the crowd were so moved by Bro. Mustaphas words that their eyes swelled with tears. He continued, "My father gave his word to just a few people in this village and in government, but, in reality he gave his word before Allah and the people of this village to teach the lesson that his word is bond, and because he has fulfilled his word, it has germinated new life in this village. Let us all strive to perform according to our promise for this is what gives us the character and integrity of a Muslim and this is what links us and makes us closer to Allah. "Prophet Muhammad (PBUH) was called Al-Amin even before He received revelation of this Book, Quran, because He was a man who gave His Word and performed after His Promise. As Muslims we cannot and must not do less," he explained. In his conclusion, Bro. Mustapha said, "May Allah bless the President of this great country and the members of his government who have helped him to perform after his promise. He promised you a new airport, a new hospital and whatever he has promised he has either fulfilled his promise or is in the process of doing so. Truly, he is a man of great character and integrity and worthy of honor and respect. May Allah bless the Imam of this Mosque and the people of the Gambia to work together to make an example of what a people who practice righteousness can do. We will continue to support the mosque and skills center until everything that we desire is completed." Shortly after Bro. Mustaphas speech, Mother Khadijah, with Binta Kinte, an 81-year-old descendant of Kunta Kinte by her side, cut the ribbon to the mosque amidst cheers, clapping and dancing. The call to prayer was made and the village of Juffureh, along with their Muslim brothers and sisters from America, gathered in the mosque for the first time for Jummah Prayer service. Attendees included Juffureh Chief Taku Taal; the family of Kunta Kinte; Osman Jallow, a member of The Gambias Parliment; Alhaji Kanteh, Commisionner of North Bank Division; Imam Karamo Jammeh; Imam Tamsir Ceesay from Senegal; Imam Khalifa Darbou from Albreda, representatives from the staff of Sheik Hassan Cissee of Senegal, and Imam Alagie Jammeh from Sitanunku. The Kuthbah was delivered by Imam Omar Darboe of Juffureh. Photos: #1-Son of Min. Farrakhan, Mustapha Farrakhan, addresses audience in Gambia, #2-Wife of Min. Farrakhan, Mother Khadijah Farrakhan with Binte Kinte in Gambia.
" Pooling our resources and doing for self "